Houston, we have a solution: bring 22,000 participants together for the Grace Hopper Celebration (GHC), the world’s largest gathering of women in computing. That’s just what happened in September, as the 14th annual event drew thousands of female technologists to Houston for three days of keynote talks, awards, expos, poster sessions and more. 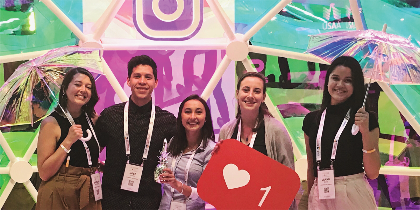 A contingent of 19 UVM students traveled to Grace Hopper 2018 with Lisa Dion, Lecturer of Computer Science; Samantha Williams, the CEMS Graduate Coordinator and Lauren Petrie, the CEMS Career Readiness Coordinator. Founded in 1994 by Anita Borg and Telle Whitney, and named for computer scientist Grace Hopper, the initial event included 500 attendees. In the years since, it’s grown to a massive conference that educates, empowers and connects women. Among the keynote speakers at the Grace Hopper Celebration was Anita Hill, who spoke the morning after the Dr. Christine Blasey Ford and Brett Kavanaugh hearings, an inspiring moment as Dion reports. Other highlights included the PitcHER contest for entrepreneurs, as AnitaB.org selected 10 finalists to compete for a total of $65,000 in prize money. During downtime, the UVM students explored downtown Houston, fueled up on coffee (Cigna baristas created lattes with student faces) and hit the swimming pool.